It's not much, but maybe it will be enough to stop hunger. - what Mommom would often say before she sat you down to an enormous and delicious meal. Above you'll see the detail of the doily that Mommom made to fit the bread tray shown at left. Bread was an important part of her diet. 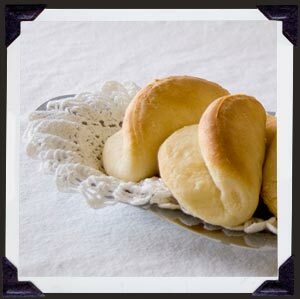 If she didn't have time to make rolls or biscuits, she would put a stack of bread slices on a plate at the table.